Alan’s been going to Clifton Leisure Centre for more years than he can remember – first bringing his children, then his grandchildren, to teach them to swim, as he believes it’s one of the most important things to learn. Before retiring, work meant Alan was very physically active, but, like others in his family, he still carried a little extra weight and, at age 50, was around 14 stone. Alan used to enjoy cross-country running at school and was good at it, but, when he left school, work and life seemed to get in the way and he stopped. At the age of 50, while on holiday with the family in Skegness, Alan was drawn to the holiday park’s gym and somehow managed a whole mile on the treadmill. After that, he was hooked! 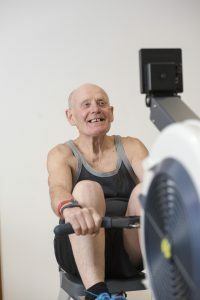 He started to use the gym at the Clifton Leisure Centre, gradually increasing his distance, and people started to notice he was losing weight. He now weighs around 10 stone. At 59, Alan started to road run with his friend, Paul. That year, without telling anyone, Alan also enrolled for his first Robin Hood Half Marathon, which he completed in just over two hours! Alan’s wife, who’s 75, enjoys swimming with him at Clifton and likes walking regularly too. Last year, Alan teamed up with Jo (37), another Flexible Fitness member, who, through Alan’s support, guidance and mentoring, managed to run her first ever Half Marathon in aid of Cancer Research and in memory of her mum. They’ve become good friends and can regularly be seen training together in preparation for this year’s event. After a break from the gym due to work pressures, Jo now trains every morning, mixing the treadmill with weights and floor work, and she can’t think of a better person to partner with. Jo really enjoys going to the gym, and her and Alan have a laugh together while they’re training – she’s recently been showing Alan how to do “the plank”, to help with his core strength! There are days, since losing her Mum almost a year ago, when Jo finds it hard to motivate herself, but all it takes is a quick phone call from Alan, encouraging her to get to the gym, and she soon finds that her mood lifts and she’s back on track. They currently run 5 miles twice a week in the gym and, when the weather warms up a little, they’ll be back out road running up to 10 miles on Sundays too. 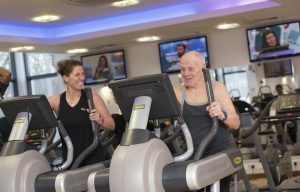 Get fit and meet new people, like Alan and Jo, with a Flexible Fitness membership check out Flexible Fitness today.